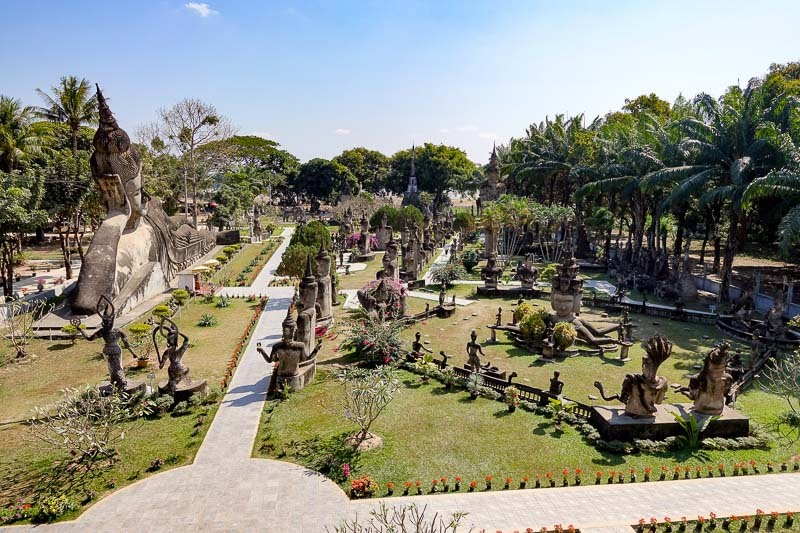 One of the best things to do in Vientiane, Laos is visit Buddha Park. I read a lot about it, but information on how to get there by bus was a bit vague. 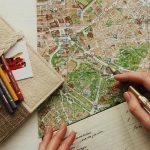 So here’s exactly how to get to Buddha Park by bus! 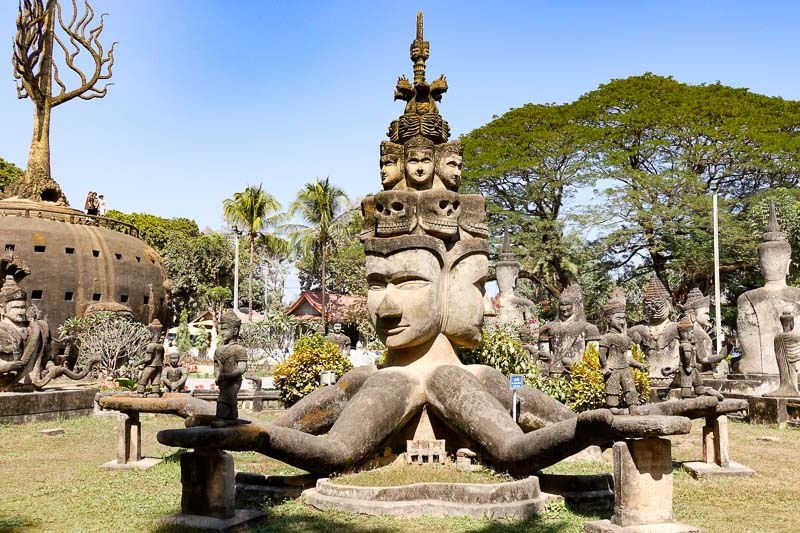 But first, what is Buddha Park? 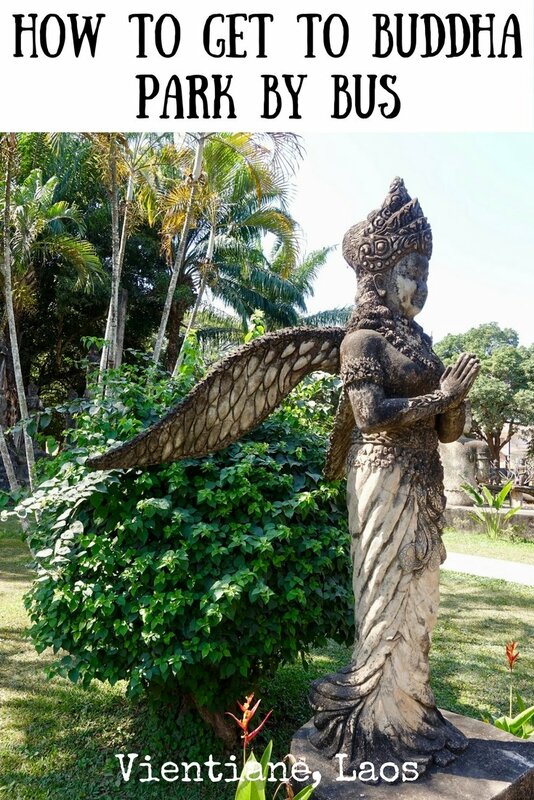 Located about 25km out of Vientiane on the banks of the Mekong River, It’s a small sculpture park filled with lots of Buddhist statues of all shapes and sizes. 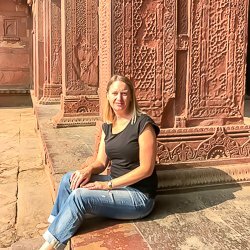 It includes a huge reclining Buddha and, strangely, it also includes many Hindu figures. 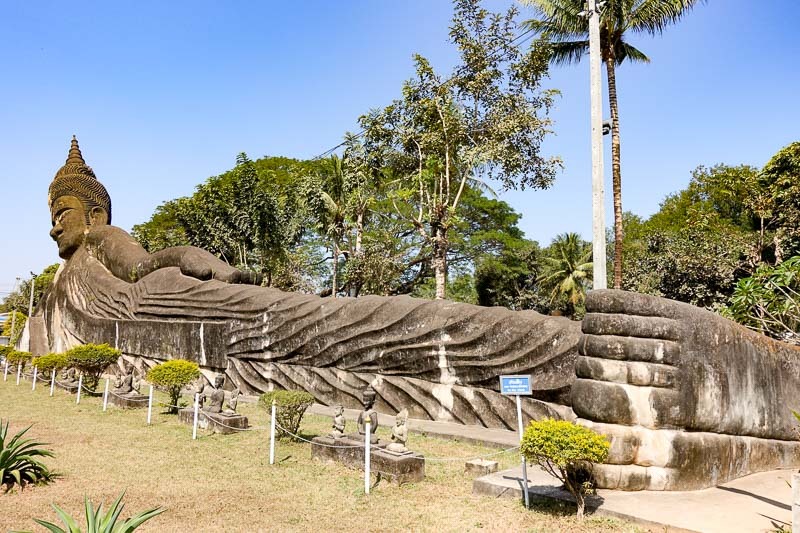 Also known as Xieng Khuan Buddha Park, it was built in 1958 by Bunleua Sulilat, a monk who had studied both Buddhism and Hinduism, explaining the unusual combination of statues. Along with the reclining Buddha, one of the other big pieces is a dome like structure (think giant pumpkin!) that can be entered and climbed, with great opportunities for photos over the whole park from the top. There is also a narrow pyramid-like structure at the opposite end of the park in the trees, and some fantastic many-armed statues of all kinds. 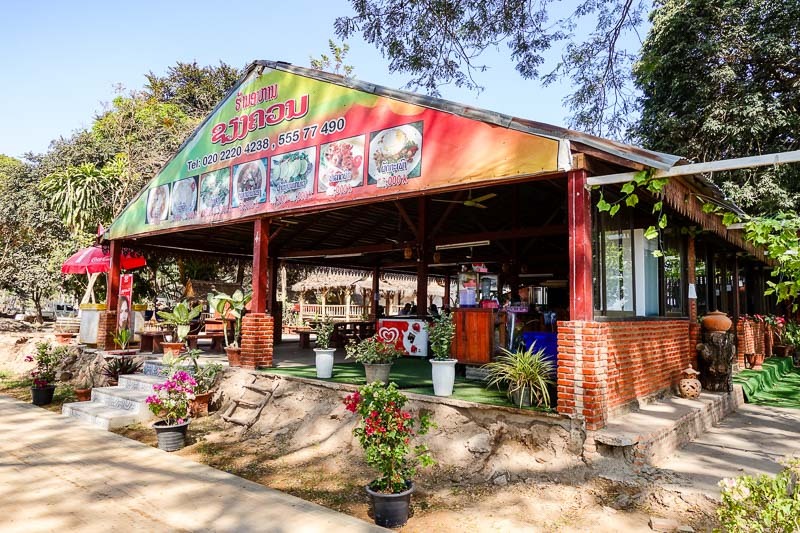 There is a restaurant on site for a delicious, cheap meal, or perhaps a break to relax with a beer overlooking the mighty Mekong River. 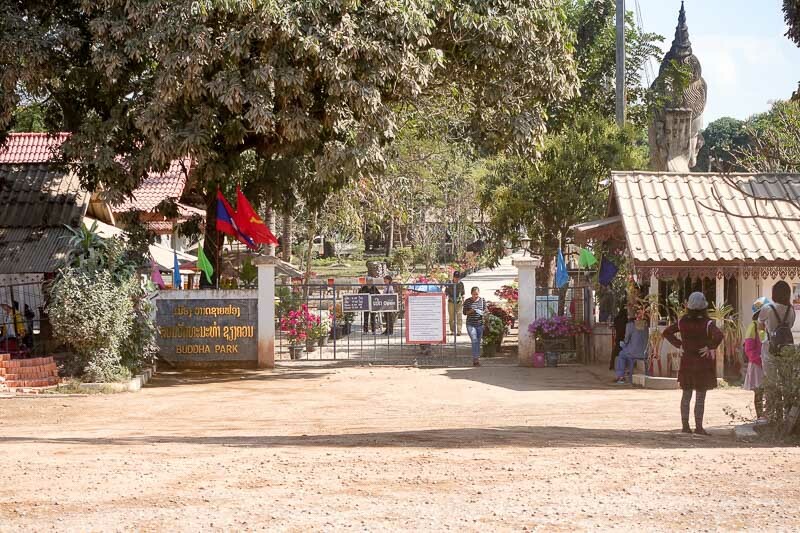 The Buddha Park entrance fees are 15000kip ($4.60 AUD/$3.65USD) and the park is open every day from 8am to 5pm. Remember as always when visiting religious sites to dress and behave respectfully. 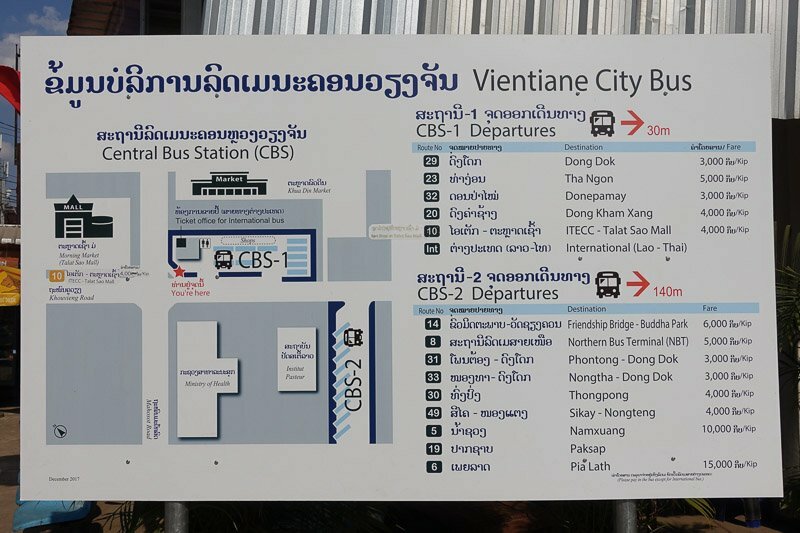 The bus to Buddha Park leaves from the main bus station in the centre of Vientiane located just behind Talat Sao Shopping Mall. The Vientiane bus station is busy and chaotic, and when you arrive it will all seem like a jumble. 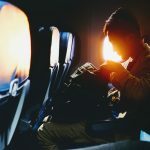 If you have travelled a lot in Asia before, this will be no surprise! 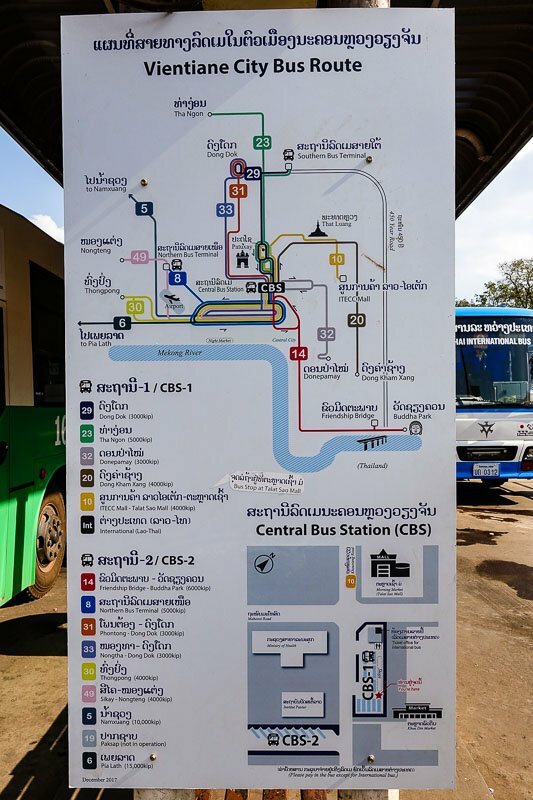 You will find though, some of the best information signs I have seen in an Asian bus station, to help you get around the city. What may not be exactly clear from the sign, is where to find the number 14 bus that you need to get on. 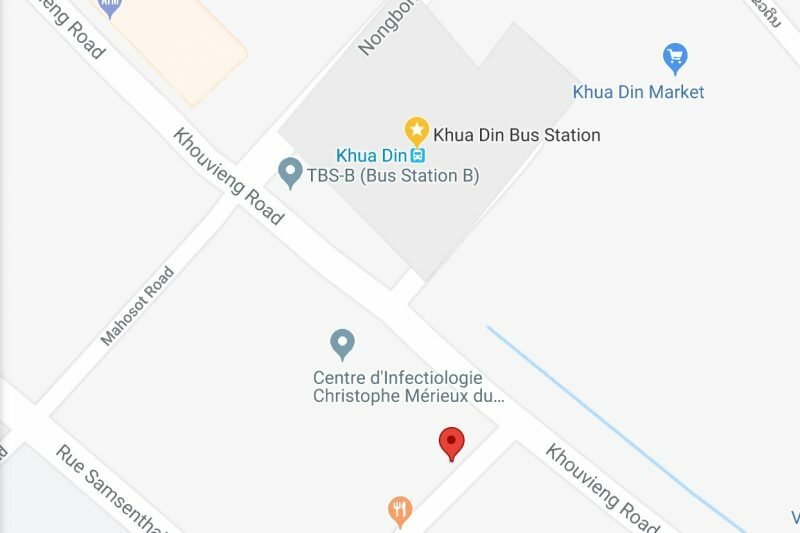 We found it parked across the road and around the corner, where the red marker is on the below map. There were no parking bays as depicted above, just parked on the side of the road near a whole pile of food stands and little shops. If you still cannot find the bus, ask some of the locals. It may take one or two goes to get someone who speaks English, but most people will happily help you. I couldn’t find information on exactly how often the bus goes, but a couple of locals said three to four times an hour, so I guess they go every fifteen to twenty minutes. We waited about ten minutes for the bus to leave. Once you find the bus, jump on! No one will ask for a ticket or stop you or try to sell you a ticket. But don’t worry, at some time after the bus leaves, someone will come along the aisle asking for payment. 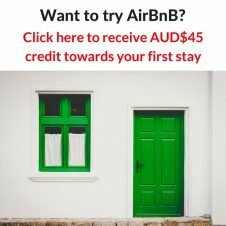 Hand over 6000kip ($0.90AUD/$0.75USD) and sit back to enjoy the ride. The first part of the trip is on good roads that lead to the Friendship Bridge over the Mekong that is the Laos/Thái border crossing. The bus heads straight for the border crossing, and at this point I was starting to worry as I didn’t have my passport with me. The bus doesn’t cross though, just drops off right near the border and turns around, going back out to the main road. From here on the road is a little rough, but you get a good look at how some more rural people live in Laos. The bus terminates just past Buddha Park, turns around then starts the return journey. You bus driver will also probably tell you where to get off. You are literally dropped off right at the gate of the park, so no wandering around looking for it. The bus stop for the return journey is just as easy to find. It is literally across the road from the gates to Buddha Park. There seems to be a concession to the tourist, and there is actually a sign that says “Bus Stop”. It’s exactly the same process to get the bus back into Vientiane. 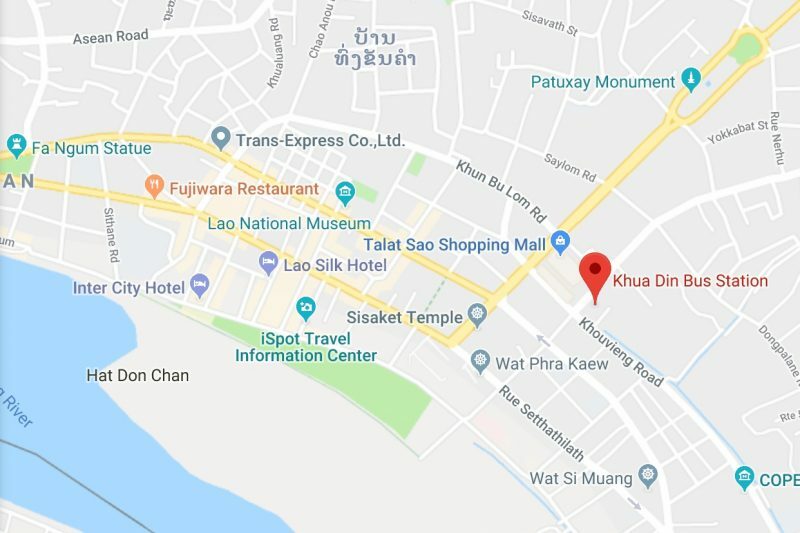 Our plan when we returned to Vientiane was to get a tuktuk to That Luang Tai temple to see the golden stupa, but after seeing how easy the bus was to catch, we got a bus instead. This trip was even cheaper at 4000kip, so it really is cheap to get around if you can utilise the buses. Using the routemap sign above and Google Maps, it looks easy to transfer from the airport to the city centre too. Read about what we got up to during out visit to Laos by clicking through to my post here. 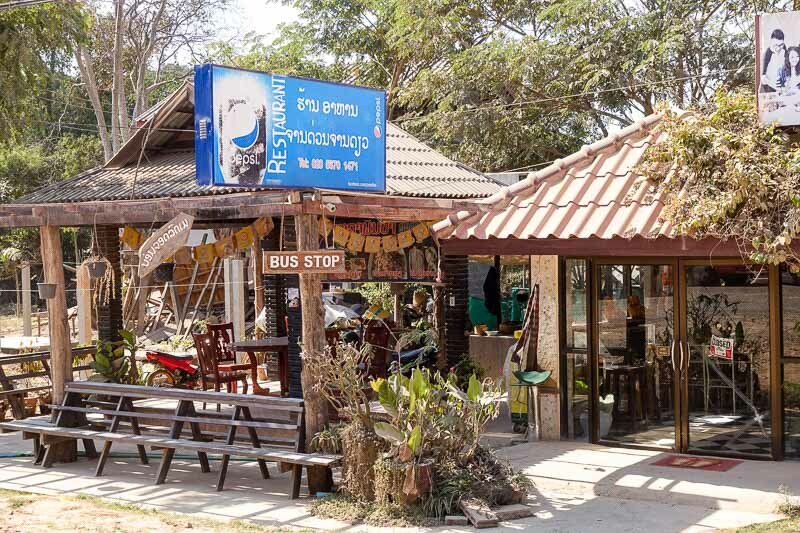 Get some more ideas from below, or click through to see all things offered in Vientiane. What About Somewhere To Stay? We stayed at the S Park Design Hotel which was fantastic. The only downside was that it was about 2km away from the centre of town. It was possible to walk (and we did, more than once), but if you want to be right amongst the action this is not the place. 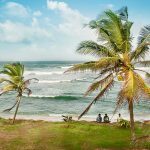 I always find great deals for accommodation on Booking.com. Click through one of the suggestions below to find the best deals for your dates in Laos. Remember, many places offer cancellation without penalty, so there is no risk if you change your mind. Thanks a lot about your article! It was a nice and easy journey on Buddha Park with it! Thanks Tiina, glad you found it useful! Thanks! 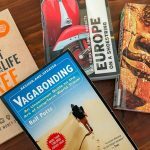 I am going tomorrow, and your post does help. Thank you! I would love to hear if anything I have written has changed so I can update it, so let me know if you have any issues.